1) Celestial Seasonings Sweet Harvest Pumpkin - At this time of year, I'm really into almost anything pumpkin spice flavored and this new one from Celestial Seasonings is no exception! It has a nice pumpkin spice flavor with a bit of natural sweetener. This tea can get spicy if you brew it with less water or by adding an extra tea bag. I like the brew this tea and then add some Coffee Mate Pumpkin Spice creamer to it. It is absolutely PERFECT! It cools down the tea a bit, gives it a nice creamy taste and sweetened just a bit more. 2) MarketSpice Tea Cinnamon-Orange: I really love cinnamon flavored teas at this time of year and this one by MarketSpice is the first one on my list. This one is extra spicy and has a nice orange zest flavor to it. If you're a fan of orange flavored teas or even chocolates, it has that same type of feeling. This one is nice for those who like a stronger cinnamon flavor since there is a bite to it. 3) Harney & Sons Hot Cinnamon Spice: This is perfect for the straight up cinnamon tea lovers. It has a nice blend of spices and of course, cinnamon. It is nice and sweet and is not too complicated. I like this one more regularly especially as a mid-day pick-me-up. 4) Twinings Engligh Breakfast Tea: I love black teas and the English Breakfast blend is probably one of my favorites. As many of you may (or may not) know, this particular blend and brand is favored in the ever-so-popular 50 Shades of Grey by the one and only Anastasia Steele. I liked English Breakfast blends before the books came out but since I had this one on had, I thought I'd feature it! This one can get dark and bitter if you steep it too long so depending on your tastes, pay attention to the darkness of your brew! I usually leave tea bags in as I sip (like for the ones above) but this one I have to take it out. I drink it straight with no cream or sweetener so I can taste the flavor of the black tea blend. I hope you enjoyed this quick post on some of my favorite teas and hopefully try some of them out! I am a lover of tea and really enjoy the different varieties there is amongst tea. I'm not a huge coffee person so tea is where my taste preferences are! I recommend checking any of these teas out if these are in your flavor profiles! If you want recommendations on other types of teas, I'd be happy to write a post on those as well! 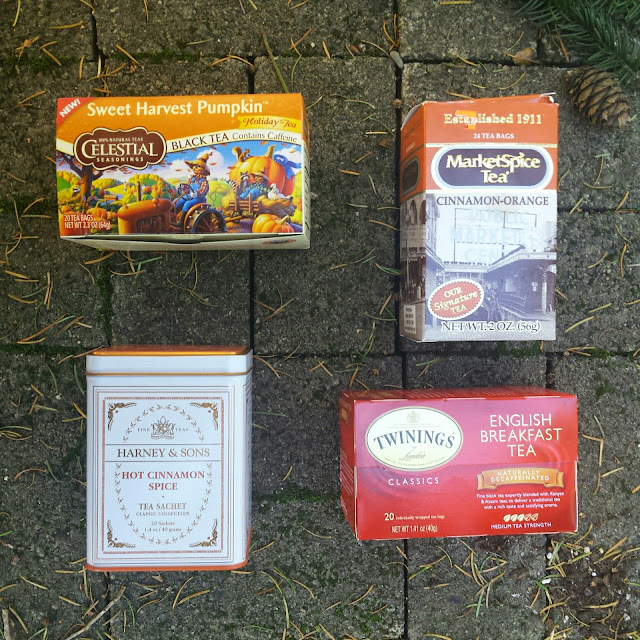 Readers, what are your favorite teas during this time of year? Is there a particular brand or flavor you prefer? Let me know! Oh yes, I love the Lady Grey one as well but I ran out of it >.< The hint of orange is so perfect! I usually don't add anything to this tea but I will try it next time with lemon and honey. I've recently tried this Sweet Coconut Chai tea and it was really flavorful and tasty too! Granny's finest sounds delicious too--plum, cinnamon and cream?! Sounds like my type of tea! mmm yes, I can drink Green Tea all year long too. I never really drink tea with milk and honey but that sounds delicious. I'm most likely going to be going to Target later on tonight so i'll be heading straight to the tea aisle!